With roof terrace with views of the Croisette and the beaches. 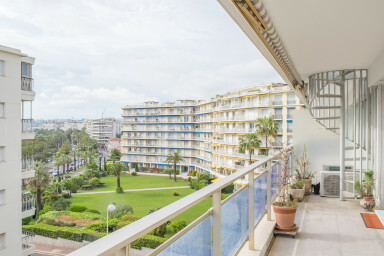 A very nice apartment just next to Port Pierre Canto with a large roof top terrace with a wonderful view of the sea and the Croisette, from Palm Beach and all the way to the Palais des Festivals and the hills of La Croix des Gardes. This is an apartment for you to enjoy both you holiday in Cannes or for a congress or festival. Both the living room and the bedroom have access to the balcony and from the balcony you have the stairs up to the roof top terrace. Bathroom with shower, separate WC. A well equipped kitchen with hob, oven and fridge/freezer, dishwasher, etc. And then the roof top terrace. Do we need to mention that this is usually the favorite place for all guests. The apartment is located in a well kept building in Pointe Croisette, the district in Cannes that is also known as Palm Beach, in calm side street off the Croisette, just next to Port Pierre Canto. Palm Beach is like and own little community at the end of the Croisette with shops and restaurants, with beaches on 3 sides of the headland. You can reach the city center in about 10 minutes, with a strolling along the Croisette. You can also take bus number 8, which runs along the Croisette from Palm Beach all the way to the beginning of the Plage du Midi on the other side of the Vieux Port. This open top double deck bus is perfect to travel along the Croisette. More like a sightseeing tour then an ordinary bus trip.